At Painted Roads we hold firmly to the opinion that you just can’t beat having your own bike with you for your cycling holiday. Your own bike is after all the bike you chose, it is the style of bike you like, it’s the machine you enjoy riding, and it’s been set up according to your own needs and desires. However we do offer good quality rental bikes so if you prefer not to bring your own bicycle to Asia then, at the time of booking, just let us know and we will take care of it. These days flying with a bicycle is a fairly straightforward process, and many airlines such as Thai Airways allow 30kgs of check-in luggage plus carry on luggage. Some, such as Virgin, allow one piece of check-in luggage up to 30kgs, plus hand luggage, plus your bicycle at no extra charge. In our experience The airlines of Southeast Asia and the oil rich states of the Middle East are the kindest to we cyclists, but please do check the airlines website for their luggage policy before booking your flight. If you decide that brining your own bicycle is for you then there is a very good chance that your bike will be suitable for most PaintedRoads tours. David’s choice of bike is the gravel/adventure bike. This machine has 700c/29” wheels with 700x40 tyres, and this is the type of bike on which PaintedRoads tours are all explored and led. For most tours a road bike will work, but we do like to add some unsealed trails where necessary with the consequence that we recommend a minimum of 700x28mm tyres and would suggest going no narrower than 700x35mm if possible. The gearing on road, cyclocross and gravel bikes can be a little tall for some of our tours. To go any taller than 34 chain ring front and 32 tooth cog at the rear as you lowest gear could be something a lot of riders would regret when faced with a twenty kilometre climb on a hot tropical day. David’s bike sports a 30/46 crankset at the front and an 11-32 cassette at the rear - he even has an 11-36 for use on tougher rides. Should you be bringing your own bike and have any doubts or concerns please get in touch. These days there is a great deal of tyre variety in the cycling world. If your machine runs 26" x 2" tyres with car type Schrada valves the chances are you can pick up a tyre and a tube pretty much anywhere, however, if your bicycle runs any one of the many other options available then findidn a tyre and/or tube can prove to be a problem, so please bring a couple of suitable inner tubes. Bringing a spare tyre is also highly recommended as a split 27.5" x 40mm tyre is going to be pretty tricky to replace in the hills of Vietnam. In recent years tubeless tyres have become rather popular. If you run tubeless it is highly recommended that you use sealant in your tyres and please be sure to bring along a couple of inner tubes as despite being highly puncture resistant we have know times when ony an inner tube can save a tubeless tyre disaster. Many people use a mountain bike and for very good reason. 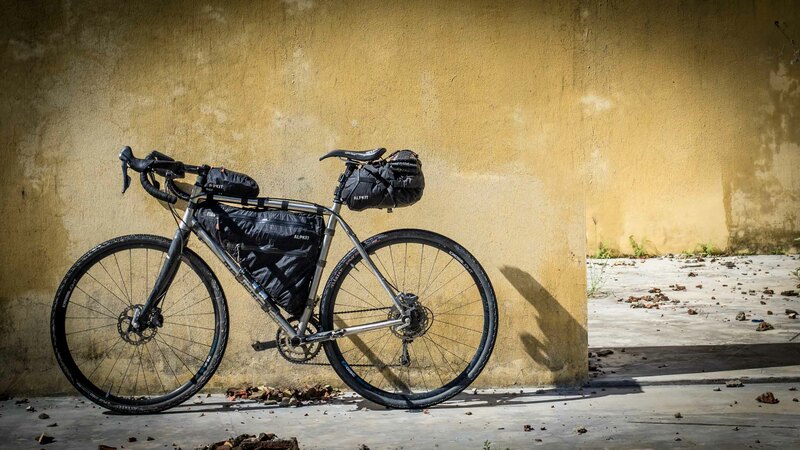 An MTB has gearing that will be suitable for any of our tours and tyres that will take you any where. You really can’t go wrong with a mountain bike. Touring bikes, as the name suggests are make with touring in mind so if your choice of bike is a touring machine you really should have no bother. There is an almost endless assortment of bicycle possibilities, and an equal unless variety of people with their own ideas of what makes for a fun machine to ride. The world has been toured by penny farthing and a uni-cycle has been ridden from Lhasa to Kathmandu. If you are in any doubt about your choice of machine please get in touch, David loves a good bicycle discussion. There are some variations in surfaces and undulations from tour to tour, so please do check through the relevant tour description for individual tour recommendations. PLEASE ENSURE THAT YOUR BICYCLE IS IN PERFECT WORKING ORDER AND FULLY SERVICE BEFORE ARRIVING ON TOUR. IF IN ANY DOUBT PLEASE SEEK ADVICE AT YOUR LOCAL BICYCLE SHOP.